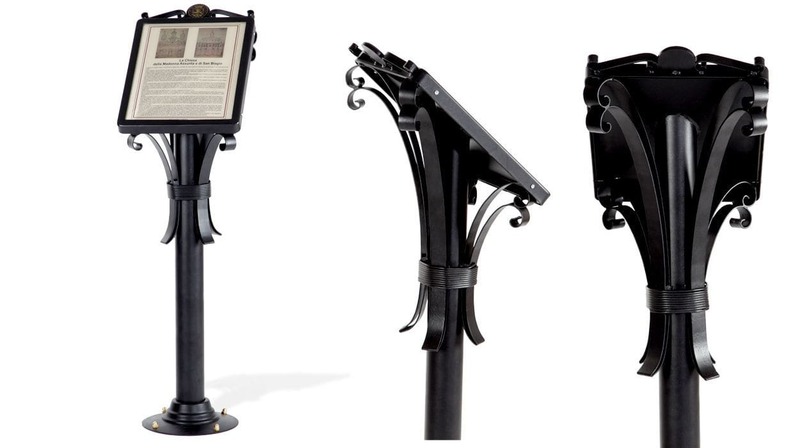 Public space information panel - BAROCCO 254 - DIMCAR s.r.l. 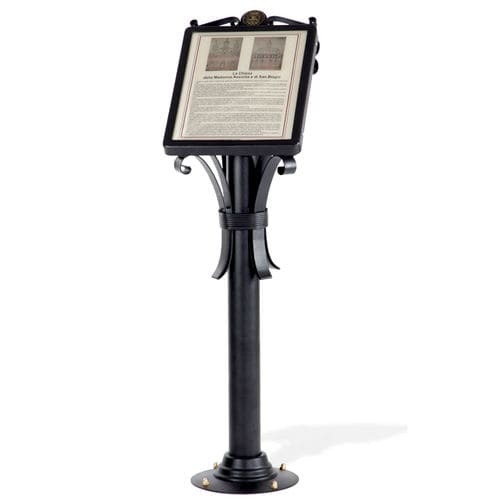 Metal reading base for monuments and public works, Baroque pattern. The structure consists of a support column made of galvanized steel round tube, adorned at the top by four hand-shaped decorative vats, galvanized flat iron. The vats are wound to the upright, in the center, from a full galvanized round spiral. Decorative flange at the base, characterized by harmonious rushes. Galvanized sheet metal reading board aligned with the perimeter. An outer frame in galvanized steel angular profile, adorned with decorative elements at the top, allows the panel to be clamped in transparent compact polycarbonate. The Baroque louvre is equipped with a flange equipped with holes for anchorage on the ground by means of pull-outs and expansion joists. The basic finish for the metal parts of this product is "gun rifle" color, characterized by a dark gray metallic effect. The customer may, however, require a different finish, chosen from the RAL colors available on our website. The painting technique used for the galvanized steel structure is made of thermosetting powders with baking.